One reason why I haven't moved completely to online note taking on my iPad is because note-taking apps don't allow me to be creative. For some of us, doodling helps. Writing in the margins helps. Coloring said doodles helps. This is where the Outline+ app for iPad and Mac really comes in handy. 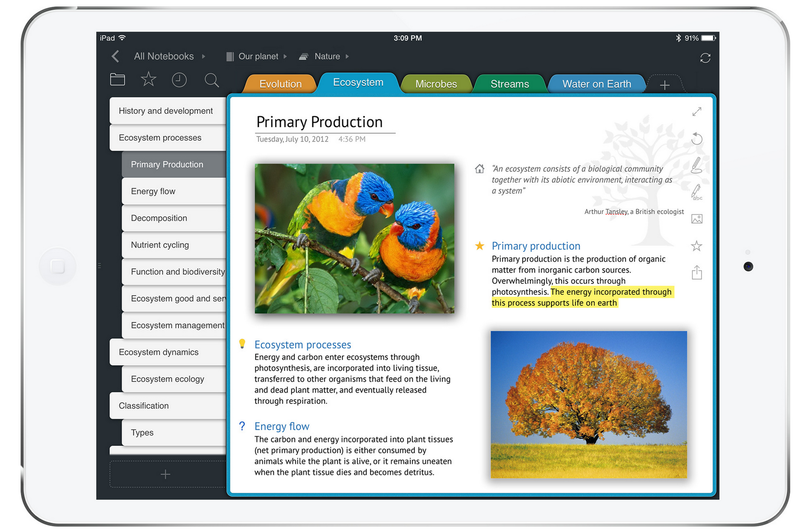 It's the first note-taking app that I've used that combines colors, highlighters, text, and handwriting with the ability to add photos from your iPad or Mac and convert it all to a PDF when you're done. The biggest pull for some: you can use it on its own, but it also functions as a third-party Mac app for Microsoft OneNote, which doesn't have a Mac version (yet). In the interface, you can create notebooks and notes galore, with the ability to customize your notes however you choose. There is a hierarchical structure, which allows you to find what you need quickly. These sections can be changed and moved around if necessary, making it a much better alternative than paper notebooks. Text can be manipulated to provide your notes with different sizes and colors. Did you draw or type something, only to realize you want to move it? No problem. You can just drag and drop it somewhere else on the page. Outline+ for iPad really provides the full editing experience you would have in OneNote or even on your Mac. You can record notes offline. You can also download all notes and password protect them if you wish. You can create tables easily! When creating PDFs, you can print your notebooks as one page or split them up into many pages. Labeling the notebooks by color is easy, and so is adding sections and pages to your existing notebooks. The search feature allows you to search notebooks for text (it doesn't work for your handwriting or drawings, obviously). Share your PDFs with established cloud services, including Box, Dropbox and OneDrive. All in all, Outline is a great replacement for cloud note-taking apps, but it doesn't have an interface for the iPhone, which may be a deal breaker for some. The iPad price is $1.99, but has a $10 add on for OneNote compatibility. The app is available for iPad ($11.99) and Mac ($10.00 limited time price! ).